A wall has been raised, the job is finished. The bricklayer looks at the result of his completed work with pleasure and satisfaction and says with appropriate pride: 'One More Wall Well Done'. 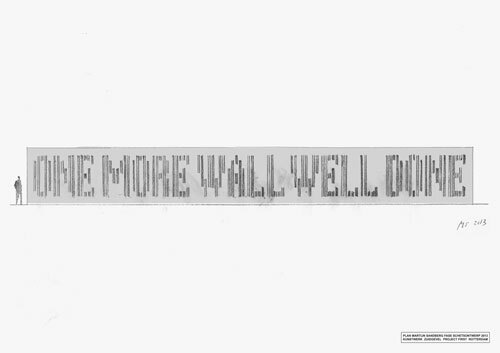 'One More Wall Well Done' is a song of praise, a hymn. The artwork by Martijn Sandberg pays a tribute in imagery and language to creation and construction, and at the same time refers to the activity of the job, the realisation of the artwork itself. Anyone listening well to the melody of the bricks resounding from the Southern facade, hears an echo. The name of the maker and the title of the artwork on the Northern facade reverberate in the sound and the sequence of the English words chosen. Martijn Sandberg's facade relief 'One More Wall Well Done' is also a compliment, a homage to the artwork 'Wall Relief no.1' (1955) by Henry Moore, which is located on the other side of the building. Scroll down for photo and concept drawing of artwork 'One More Wall Well Done'. 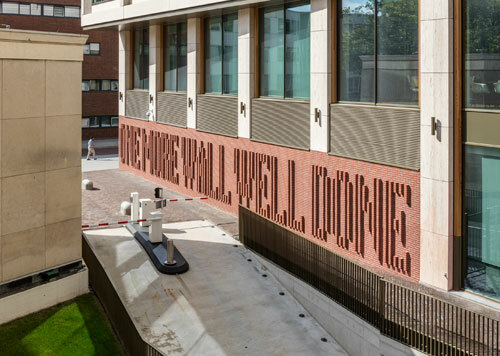 'One More Wall Well Done', wall relief by Martijn Sandberg, brickwork, (lxh) 27.30m x 3.50m, 2016. 'One More Wall Well Done', concept drawing by Martijn Sandberg of wall relief in brick, 2013. Project: Site-specific artwork, First building, Southern facade, Weena, Rotterdam, 2013-2016.